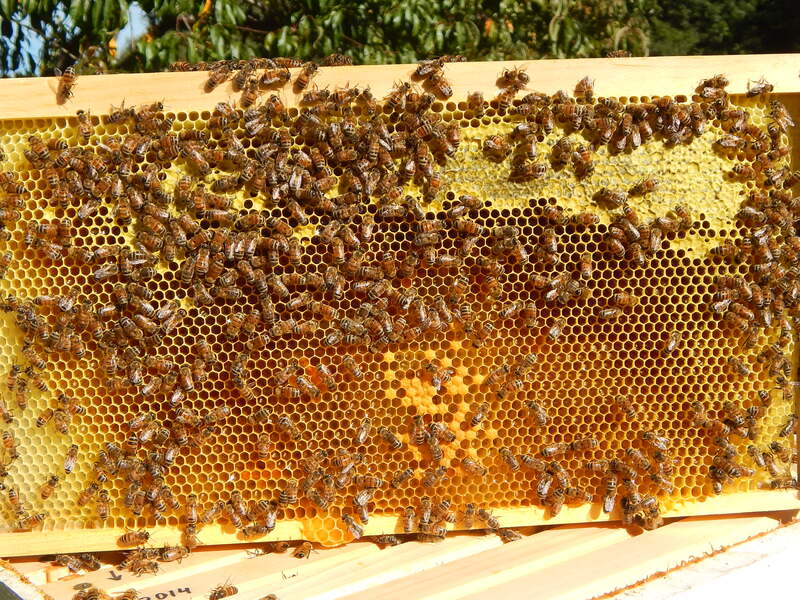 A frame that recently contained solid brood now only has a few capped brood cells, the rest is stuffed with fresh nectar. I have heard people talk about “switching boxes” and “moving frames” to help the bees prepare for winter, but I rarely see a need for that. As the picture shows, the bees instinctively replace the brood in the upper part of the brood nest with their winter supply of honey, and move the brood-rearing down lower in the hive. 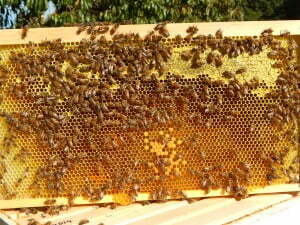 You should also see a large amount of pollen stored in the lower deep around the brood. If your bees fail to do this, it alerts you that they are not getting the fall flow they need and should be fed with sugar syrup and pollen substitute. My bees never make much use of the lower deep if the “varroa screen” is left open so I recommend closing the varroa screens prior to the bloom of Tall Goldenrod. The bees like it cozy. It is critical to know the state of your hives at this time of year, so be sure to check them out!